By using our site (this “Site”), you are agreeing to comply with and be bound by the following terms and conditions. If you do not agree to the following terms and conditions, you may not use this Site. The terms “SWCT/NY Weather” , “us”, “we” or “our” refer to SWCT/NY Weather. The term “Service” includes, but is not limited to, the text, content, graphics, audio or video produced by SWCT/NY Weather and appearing on this Site. The terms “you” and “your” refer to the user of the Service or viewer of this Site. By using this Site, you represent to us that you have read and agree to the terms and conditions set forth in this legal statement, which constitutes a legal and binding agreement between you and us (the “Agreement”). This Agreement constitutes the only and entire agreement between you and us, and supersedes all prior or contemporaneous agreements, representations, warranties and understandings with respect to your use of the Site and the Service. This Agreement may be amended at any time by us, and from time to time, without any notice to you. The latest Agreement will be posted on the Site, and you should review the Agreement prior to using or viewing this Site or the Service. You also agree to comply with U.S. law regarding the transmission of any information or data obtained from the Site or the Service in accordance with this Agreement. You also agree to not disrupt or interfere with the Site or the Service or use the Site or the Service for illegal purposes. The works of authorship contained in the Service, including but not limited to all data, design, text, images, charts, audio, video or other data compilations or collective works, and all trademarks, tradenames, service marks and other intellectual property, are owned, except as otherwise expressly stated, by SWCT/NY Weather or one of our data providers, and may not be copied, reproduced, transmitted, displayed, performed, distributed, rented, sublicensed, altered, stored for subsequent use or otherwise used in whole or in part in any manner without the prior written consent of SWCT/NY Weather in each instance. This Site and the Service are protected by copyrights, trademarks, service marks, international treaties, and/or other proprietary rights and laws of the United States. The Site and the Service are also protected as collective works or compilations under U.S. copyright and other laws and treaties. All individual articles, columns, and other elements making up the Site or the Service are also copyrighted works. You agree to abide by all additional copyright notices or restrictions contained in the Site or the Service. All information, data and analysis contained in the Site or the Service are provided “AS IS” and without warranty of any kind, either expressed or implied. All information, data and analysis provided by the Site or the Service is for informational and educational purposes only. SWCT/NY Weather believes all information, data and analysis contained in the Service to be accurate, but does not guarantee its accuracy. Under no circumstances, including, but not limited to, negligence, shall SWCT/NY Weather, any of SWCT/NY Weather´s affiliates, employees, or other third party data providers be liable to you for direct, indirect, consequential, incidental, special, punitive or exemplary damages even if an authorized SWCT/NY Weather representative has been advised specifically of the possibility of such damages, arising from the use of or inability to use the Site or the Service, such as, but not limited to, losses, loss of revenue, anticipated profits or lost business. Applicable law may not allow the limitation or exclusion of liability or incidental or consequential damages. In no event shall SWCT/NY Weather´s total liability to you for all damages, losses, and causes and action (whether in contract or tort, including but not limited to negligence) exceed the amount paid by you, if any, for accessing this Site or using the Service. All opinions expressed on this Site are subject to change without notice, and you should always obtain current information and perform appropriate due diligence before making decisions. The Site may from time to time display links to other websites or resources sponsored by third parties as a convenience to you. We are not responsible or liable for, and do not endorse, the content or operation of such third-party websites, including but not limited to the advertising, products, services or other materials on or available from such websites or resources. Various third-party websites may provide links to this Site. We have not reviewed any or all of the third-party websites linked to this Site. We are not responsible for the content of any off-site pages or any other websites linked to this Site. Your linking to this Site, off-site pages or other websites is at your own risk. Either you or SWCT/NY Weather may terminate this Agreement with or without cause at any time and effective immediately. You may terminate the Agreement by discontinuing use of the Service and destroying all materials obtained from the Site or the Service. This Agreement will terminate immediately without notice from SWCT/NY Weather if you, in SWCT/NY Weather´s sole discretion, fail to comply with any provision of this Agreement. Upon termination by you or upon notice of termination by SWCT/NY Weather, you must destroy promptly all materials obtained from the Site or the Service and any copies. The Copyrights and Trademarks and Disclaimer and Limitations of Liability provisions of this Agreement shall survive any termination of this Agreement. This Agreement and your use of the Site and Service will be governed by the laws of the State of New York, as applied to contracts entered into between New York residents and performed in New York. Any dispute arising out of this Agreement or your use of the Site or the Service will be heard only in the state or federal courts located in Westchester County, New York USA, and you consent and submit to the personal jurisdiction of such courts. This Site is controlled and operated from the United States of America and we make no representation that any information, data or analysis contained on this Site or in the Service are appropriate for use in other locations. If you use this Site from other locations you are responsible for compliance with applicable local laws. SWCT/NY Weather reserves the right to change the prices of any products or subscriptions provided by the Service. Unless otherwise specified, all subscriptions to the Service will be automatically renewed when they come up for renewal using the payment information we have on file. Subscriptions may be cancelled at any time, and pro-rated refunds are available for seasonal and annual members after the first month of service. Monthly subscriptions are non-refundable. 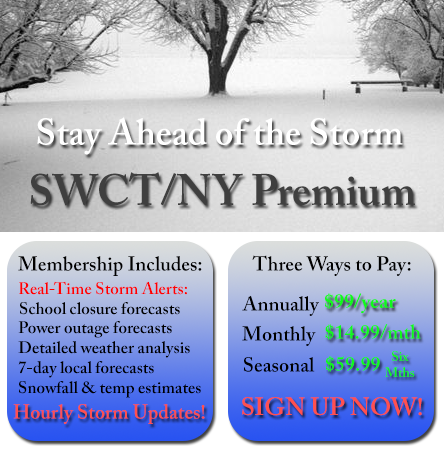 All payments made to SWCT/NY Weather are made through a third party service. SWCT/NY Weather is not liable for any monies lost during the transaction process, non-payment issues or declination of any credit card. The Site or the Service may be temporarily unavailable from time to time due to required maintenance, telecommunications interruptions, or other disruptions. Although SWCT/NY Weather makes every reasonable effort to minimize such downtime, SWCT/NY Weather does not guarantee full availability of the Site or the Service. If any provision of this Agreement is found invalid or unenforceable, that provision will be enforced to the maximum extent permissible, and the other provisions of the Agreement will remain in force. This Agreement states the entire agreement between you and us relating to use of the Site or the Service. This Agreement may not be amended except as provided above. If you have any questions, concerns or comments, please email jacob AT swctweather.com. We collect only relevant lawful information about you and our other readers and clients in order to conduct our business in a way to properly service you. Sources of financial and personal information include information (such as your name, address, telephone and fax numbers, email address, etc.) provided by you through contact and request forms as well as oral, written or email communication and credit card and bank information obtained from your transactions with us and our affiliates. Visiting sections of our website does not require supplying any information, and any information supplied is done so on a strictly voluntary basis. Information used to determine your identity is only information provided by you. When you visit sites in the SWCT/NY Weather network, our servers may also collect web site usage information and information about your computer, including your computer´s operating system, internet browser type, your computer´s IP address, and if you arrived at one of SWCT/NY Weather´s sites via another website, the URL of the linking page. SWCT/NY Weather maintains permanent records of all of our present and prior clients including contact info, usernames and passwords, and all financial transactions. Once information is provided to us, such as contact information for subscription services, we maintain the right to keep that information indefinitely. We do not disclose any nonpublic personal information about our readers or clients (both present and past) to anyone, except as permitted by law. As the law permits, we may share personal information about you with our partners or affiliates and other third parties who provide services for your accounts. This information includes, but is not limited to information provided by you through forms, applications, and oral, written or email communication; and information derived from your transactions with us such as, but not limited to: amount of payment, method of payment, and user name and password. We do not provide or sell our mailing lists to any third parties, except unless it is in connection with the provisions of our services. When any information is provided to third parties, it is only done so on the condition that they keep your information confidential. If you believe we have shared your information inappropriately, please contact us. We do not share information about any of our clients, readers, or subscribers with any third party unless we have the consent of that person. We will only divulge information as necessary to comply with state and federal laws and regulations. Whenever possible, a client may choose to not disclose information. 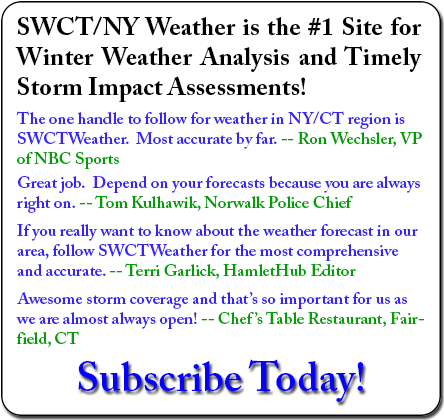 Personal information you submit to SWCT/NY Weather through our website is secure once it reaches our servers. The information you submit is not secure as it travels from you to our servers. Email communication is often non-secure however, and clients should be aware of this when providing personal or confidential information in email. We will never require that clients provide any information to us through email communication, and will gladly take any relevant information over the phone or by mail. Access to your nonpublic personal information is limited to our employees with a reason to have that access. All of our employees with access to client info are expected to and held to the utmost standards in respecting the privacy and confidentiality of our clients´ personal information. Clients can have information corrected or changed at any time and as often as necessary by contacting us. Unless otherwise specified, all subscriptions will be automatically renewed when they come up for renewal using the payment information we have on file. Subscriptions may be cancelled at any time, and pro-rated refunds are available for seasonal and annual members after the first month of service. Monthly subscriptions are non-refundable. Finally, other contracts for service may be cancelled in accordance with the terms of the contract.